Well, it was barely five p.m. when I poured this glass of wine, and it’s a big glass, too. I’m going to finish it all up, and maybe have another. The first time he went to Greece and I was left waving and smiling, waving and smiling, waving and smiling, until he was no longer visible behind that security line, he was six years old. His father and I had agreed to a “trial separation,” and my then husband wanted a summer in Greece, wanted to take his son with him to see his mother, my son’s grandmother. But I didn’t. I thought about it. I though about a humid, endless summer in Astoria, Queens, where the asphalt in his school yard got hot enough to go soft, and the nearest beach was an hour drive away. Where restless teens gathered each night to scream out their frustrations and smash bottles, the noise of it, the pain of it, so close that we wanted to cover our ears. Or call the cops, who never came. That, versus a summer in Greece, where he was still young enough to swim naked in seas that were so clear and clean you could see all the fish. I thought of his grandmother, who was as uncaring of my hurts as her son was, but who was a wonderful grandmother to my boy. I thought of her cooking for him, playing with him, swimming with him. And in the end, I let him go. One friend told me, “What an act of selfless motherhood. I don’t think I could do it. I don’t think I could have let him go. But you did it,” and I hugged that to my heart, all that long, lonely summer when all I thought about was what a failure I was at marriage and how much–how horribly, sickening much–I missed my little boy. No stories read at bedtime, no trips to the Central Park Zoo, to the Hayden Planetarium as I’d planned–just endless days and nights alone, without my baby, thinking about my shortcomings. And that was our first airport good-bye. He didn’t know, we hadn’t told him, that his life was about to fall apart because the two people he loved and trusted most in the world couldn’t make it. I’d made up some story about his “Baba” working far away, and having to not be home, and as much as he missed his father, he bought my lie. That afternoon at the airport, it occurred to him. I smiled and made up another lie. And he was such a centered, secure human being at that time, that he believed me. He got on that plane, happy, eager, never knowing that his mother, that woman who was smiling and waving, was so broken inside that she wanted to die, right there, at JFK airport. There was a man standing next to me, as I waved and couldn’t stop waving. He knew immediately. He was sending his children off too. “It just keeps getting better and better, doesn’t it?” he said to me in sympathetic sarcasm. Yes. There is no pain–NONE–like leaving your child. The next time we said good-bye at an airport, he was seven, and this time, we were leaving New York to live in Greece. His father and I had gotten back together and we were going to really TRY to mend our marriage. And part of that effort was for me and my son to move to Greece, where my then husband, the father of my son, had been born. I want to say, if you’re thinking about doing something like this–uprooting your job, your life–to go to an entirely different place, let me tell you, please, please, please do not do it, unless you’re reasonably sure that the person for whom you’re doing it understands what you’re doing, and VALUES it. So, now, my son and I were saying good-bye together–to our life in New York, to my career as a teacher, which I had fought long and hard to obtain, to our family, to our friends, to his friends, to his school, to his train set, to his turtle named Joe. And most of all, to his older cousin, Eric, whom he worshiped. But he cried hard, hot tears, with his face in my lap, all the way from New York to Athens. And for ten hours, I wondered if I was doing the right thing for him–keeping our family together, keeping him with a father he adored, but at the same time, giving up everything and everyone else he knew. We made a good life in Greece, but this still eats at my gut–was this the right choice for my little boy? Do we ever think, ever realize how much our children depend on us to make those right choices, to keep them well and happy and safe, because they are too small to do so for themselves? 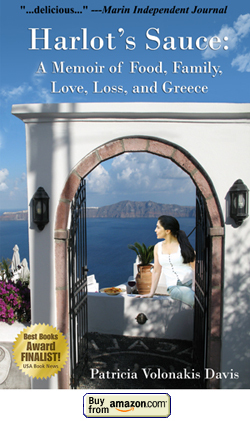 I got to Greece with my precious little boy, and in six months, my marriage to his father fell apart for the final time. Again. I hadn’t seen the untenable position in which I’d put my eleven-year-old. So, I started going out with friends more often, and I even started dating again, tentatively. And then one day, I met a man. A miraculous man. A lovely, kind, smart, funny, wonderful man. A man who has driven me out of my mind with his quirks and foibles, yet who has showered me and my son with his love and respect for the past nineteen years. So, there was another plane ride. One in which my son, now thirteen, was charged with “please” not “mentioning” to his father that I’d met someone. Because IF he knew, there would be a battle to get my boy out of Greece and back to the United States. Now—here is the truth with no bark on it–my then thirteen-year-old son didn’t want to return to the USA. And yet, he sat there, looked his father straight in the eye, and told him that, yes, he wanted to move. Again. He did that for me. And then there was the mandatory stint in the Greek army. No, no, no, no, no. War is bullsh^t fought for corporations and I wasn’t about to sacrifice my son’s life. Had we stayed in Greece, he would have had to serve, and let me tell you, whether you agree with me or not, THAT was going to happen ONLY if I were in the ground first. That meant another plane ride. To California, this time. He doesn’t hate me anymore, or so he says. But I’ll never forget that. How could I? I’ve sinned as much as the next person who tries not to sin but does so anyway, and let me tell you–my biggest sin is dragging my son to three different countries–New York, to Athens, Greece, and then to the Bay Area of California. He suffered. He knew not who he was or where he belonged. If you’d asked me then, each time I’d moved us, I would tell you that I thought I was doing the right thing for us, for him. And, he suffered. He never fit in, a state of being that is so vital to any teenager. True, he learned to speak two languages, fluently (nothing makes me puff up with pride more than to see him reading a heavy tome, and I’m over the moon to see him be able to do such in TWO languages. He saw things in his first twenty years of living that some of us don’t see in a lifetime. He is so compassionate, because, from his life experience, he KNOWS of the pain of others, having witnessed it in a circumference of living that is far wider than most. He is more worldly, informed, savvy than many 60-year-olds I know. And yet, it came at a cost. He is also sad and lonely at times, too. He didn’t know who he ‘was.’ And that was because he was thrust into a life situation I, as his mother, would never have wished upon him. My fault for the choices I made. And in now knowing who he is, he now knows where he needs to be. And my penance for all I put him through is that it is THOUSANDS of miles away from me, forever. My penance is to forever wave good-bye in airports, starting from when he barely reached my heart, to now, when he reaches from a foot above me to kiss the top of my head. But the truth is, he is, and I’m not. He’s left and left, and each time he goes, I know we’re one trip closer to the LAST time he’ll leave. So, yeah. I’m having a glass of wine, or two, and wishing Kalo Taxidi (“Good travels,” in Greek) to a human being who persevered and triumphed over two parents who brought him into this world without ever thinking of the impact on his life their choices might make. Good travels, son–you always have my love. But you deserve so much more.